Green storage may no longer be centre stage, as it was at the height of its hype a few years ago, but the need to reduce datacentre energy usage ensures that green storage is still a pressing concern. That is because storage is gobbling up an ever-larger portion of datacentre energy. 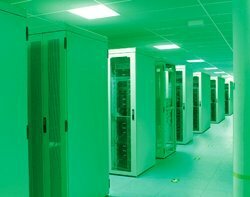 Global datacentre energy use is growing at about 7% a year, with storage consuming between 10% and 40% of all energy in any particular datacentre, according to the Storage Networking Industry Association (SNIA). The SNIA estimates that servers consume 60% of a datacentre's energy, leaving networking and storage with 20% each. However, the servers' share is falling because virtualisation reduces energy consumption, leaving storage with a larger proportion of the whole. This clearly affects enterprises’ bottom lines directly, but there are other impacts, too. Analyst Clive Longbottom, service director at Quocirca, says: "Those in the high-energy usage markets will be caught up in the Carbon Reduction Commitment (CRC) tax system, so anything they can do to lower energy usage will be useful. "Those who aren’t caught in the CRC web can still do with saving energy. It costs money, after all, and with the lack of efficiency there is in IT equipment, every extra watt of energy going in will create a significant percentage of heat that needs to be cooled. So, each watt needed for storage could end up as 2.5W or more of actual energy consumed, assuming a power usage effectiveness [PUE] ratio of 2.5." Longbottom's advice for businesses that want to reduce their storage energy bill is as follows: "First, de-clutter by getting rid of unwanted and/or unneeded data. Then work on cleansing data – make sure what you have is what you should have. Apply data deduplication to reduce the amount of data under storage by as much as 80%. Virtualise, so you can pool storage and make more efficient use of it. Minimise the number of arrays being used. Turn off, put in off-site storage or sell redundant arrays." Longbottom adds: "Where possible, move to flash storage. It is a much lower energy user and gives out a lot less heat. If not moving to flash, make sure you have variable-speed disks that can go into a low switch-down mode when not being used, to minimise energy usage. Use off-site storage systems where they make sense. Energy costs are then included in the data subscription price and can be guaranteed across a longer period of time. "Also, look at how server-side storage can be used. The age of the SAN is coming to an end; every converged computing system has its own direct attached storage; every blade, every tower, every pizza-box server has a hard disk drive in there." SNIA board member SW Worth offers advice as part of the organisation's green storage initiative. He says data reduction techniques are key to the type of de-cluttering suggested by Longbottom, and the most effective combination uses RAID 6 with snapshots, data deduplication and thin provisioning. But not all energy-saving technologies have succeeded. One example is MAID (Massive Array of Idle Disks), for which Nexsan is now the standard-bearer. As Storage Switzerland analyst Eric Slack points out, the technology has not proved very attractive because the number of use cases is limited. He says: "Too many applications couldn’t tolerate the wait of up to a couple of minutes to access data as drives spun up and IT wasn’t willing to take the chance that this data would be recalled." No single solution can reduce storage power consumption, says Steve Watt, CIO at the University of St Andrews. "Any future reductions will be achieved through a combination of efforts and by dealing with the issue from all angles, such as looking at the whole datacentre ecosystem," he says. The biggest savings can be achieved by reducing the number of spinning disks in the datacentre. However, in a highly efficient storage system, most disks will be needed most of the time, says Longbottom, which reduces potential savings here. Flash storage costs more, but can help resolve this dilemma. An Intel-sponsored report from J Gold Associates calculates that payback can be achieved within days, given the reduction in energy use, maintenance and hardware failures possible with flash storage. As a consequence, Longbottom predicts much greater usage of flash at reasonable prices as EMC productises more of its XtremIO and DSSD IP, and IBM does likewise with its TMS acquisition, while the pure plays – Pure Storage, Violin, Nimble, and so on – also make progress. But purchasing patterns and deployment details are not the only means of reducing energy consumption. Storage suppliers can help by cutting their products' energy use and SNIA has developed a set of criteria that help suppliers test and label the energy usage of their products. Its Emerald Program aims to provide a uniform format to report storage system power requirements, power usage and efficiency under various workloads. Customers have also responded to the need to reduce energy. A survey of European storage professionals by SearchStorage in 2010 found that green storage considerations are important when buying storage hardware and that many users would pay extra for more energy-efficient hardware. Testimony to the importance of "green friendliness" is that 66% of those questioned would pay more for a green product. Watt has taken steps to reduce energy use in line with his university’s aim of becoming carbon neutral by 2016, such as consolidating storage from 400 servers spread across 50 sites into a Dell Compellent SAN. He says: "This has resulted in a significant reduction in power usage, especially as it was combined with an aggressive virtualisation of application servers and the locating of these in a highly efficient campus datacentre. “Reducing energy use entails utilising the inbuilt features and functionality of the Dell Compellent SAN. This has allowed us to use thin provisioning of storage, which provides efficiency gains in utilisation, requiring fewer disks, while hierarchical storage management has also allowed far more effective resource utilisation. This SAN also delivers file deduplication, which further optimises our use of storage."